The summer sun has given our developers an extra boost and we have a sunny surprise for our users and the organizers of the TED conferences. You can now create TED Rich Media Tags with Thinglink! Just insert TED talk URLs straight into a tag’s link field and it will turn it into a video tag much in the same way as our previous YouTube and Vimeo video tags. We love the innovation and inspiration TED brings to the world and we want to make it easy for everyone to embed and share TED videos on their images. 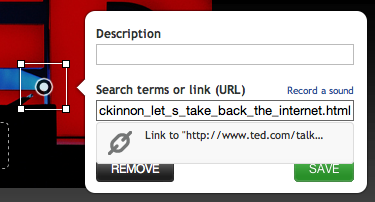 Remember that the TED tag is only one of many ThingLink Rich Media Tags and all of them are as easy to set up. Visit ThingLink now to set up your own account.